Eating berries may lower your risk of heart disease. 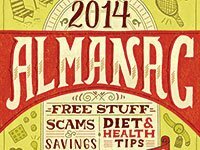 En español l The AARP 2014 Almanac features useful information about topics ranging from financial scams to film trivia to how to get free stuff! The almanac also contains these smart tips for staying healthy all year long. Feeling groggy, a little sick and lethargic? It might not be a hangover. Over-the-counter sleep aids can mimic the effects of too much booze. Resolve to get on a regular sleep schedule, avoid caffeine and long daytime naps, exercise regularly and keep stress in check. Staring at cellphones and computers can make dry eyes feel even worse. The Mayo Clinic recommends using the 20/20/20 rule: For every 20 minutes you're on the computer, look away at an object at least 20 feet away for 20 seconds or more. Flossing may protect you from Alzheimer's, says a British study that found bacteria from gum disease in brain samples of some people who died of the disease. So while you're sampling Valentine's Day chocolate, remember your dentist's advice: Brushing is not enough. You should floss at least once a day. March is National Kidney Month, the perfect time to remind adults 60 and older to get an annual urine test to screen for kidney disease. The National Kidney Foundation recently changed its guidelines in light of research showing that 59 percent of Americans will at some point have moderate kidney disease. Persons with high blood pressure or diabetes face a special risk. A 15-minute walk after eating can lower your blood sugar level for hours, and significantly reduce your risk of diabetes. More important, taking a short walk after meals can be much more effective at preventing blood sugar spikes than taking one 45-minute walk daily. What better way to get started than National Walking Day on April 2? This is Celiac Awareness Month. Some 3 million Americans have celiac disease, which means they're unable to digest gluten — a protein found in wheat, barley and rye. The Food and Drug Administration has new guidelines for foods labeled "gluten-free," including a requirement that they contain less than 20 parts per million of gluten. Eating berries can lower your risk of heart disease significantly. A study of nearly 94,000 women found that those who ate three or more servings of blueberries and strawberries a week had a 32 percent lower risk of heart attack. With peak mosquito season here, it's important to remember they spread diseases to humans and animals. Electric fans are an effective way to keep mosquitoes away from people and pets in the backyard. If you're unlucky enough to get bitten, a dab of simple household ammonia will counter some of the chemical reactions that make your skin itch. Packing for a trip to the beach or lake? Keep food safe by making sure your cooler stays cold enough during the drive. Block ice keeps food colder than cubes. Plastic bottles filled with water and kept in the freezer overnight work well, too. Remember that a full cooler stays cold longer than one that's partially filled, and be sure to keep frozen meat and poultry securely wrapped and away from produce or snacks. Fitness trackers for logging information about summer workouts are getting smarter — and cheaper — all the time. The typical tracker now costs less than a month's fee at a fitness club. One model about to hit the market not only measures how many steps you take and how well you sleep but also recognizes more than 100 different exercises; it also measures your heart rate and blood oxygen level and tabulates how many calories you burn. You can get your copy of the almanac — right now! For National Prostate Cancer Awareness Month, we remind men that mindlessly popping omega-3 fish oil pills may not be a good idea. Studies show that men with high levels of fish oils in their blood — either from pills or from eating fatty fish more than twice a week — are at increased risk for the type of prostate tumors most likely to be fatal. New research suggests that yoga is a good way to lower your risk of a fall. Falls send more than 2 million older Americans to the emergency room each year. By promoting balance and muscle strength, yoga not only helps prevent falls but also lowers injury rates. Another study found that waltzing around your living room three times a week can also reduce your risk of a fall. This is Depression Awareness Month. Although coffee certainly isn't a cure for serious depression, a recent Harvard study, based on 16 years of data from more than 200,000 adults, found that drinking two to four cups of java a day may lower suicide risk — by half. Researchers believe that caffeine, a mild stimulant, may be a mood booster. If the onset of shorter days fills you with dread, you may have seasonal affective disorder (SAD), a type of depression that comes and goes as the brain chemicals called neurotransmitters — which are sensitive to light — fluctuate throughout the seasons. How to beat the "winter blues"? Get more Vitamin D. Exercise. Get outside every day. Get enough sleep. And consider light therapy — sitting next to a type of bright light that mimics natural outdoor light. It's easy to overeat during the holidays, so why not go into the season with a plan? Here are some suggestions: Stick to smaller plates and smaller servings. Split an entrée — or a big portion of anything — with someone else. And say no to seconds. Drink lots of water. When it comes to dessert, go for fresh fruit. And if you're eating out, take home half of your meal to enjoy later. November is Lung Cancer Awareness Month. There will never be a better time to quit smoking. If you are age 55 to 79 and smoke more than a pack of cigarettes a day, or have within the past 15 years, you should ask your doctor if he recommends a CT scan, which can catch lung cancer early. With flu season at its peak, these seven foods may help keep you healthy: almonds (antioxidant vitamin E); black-eyed peas (a good source of zinc); carrots (vitamin A helps fight respiratory infections); mushrooms (selenium wards off flu); tea (green or black has powerful antioxidants); tomatoes (vitamin C); yogurt (probiotics).